← How to convert HTML to Image on Linux/Unix system? Convert HTML to JPG from PHP, ASP, C#, etc. program languages. PHP API to convert and capture web page to JPG. Webpage Screenshot Capture Cloud API. 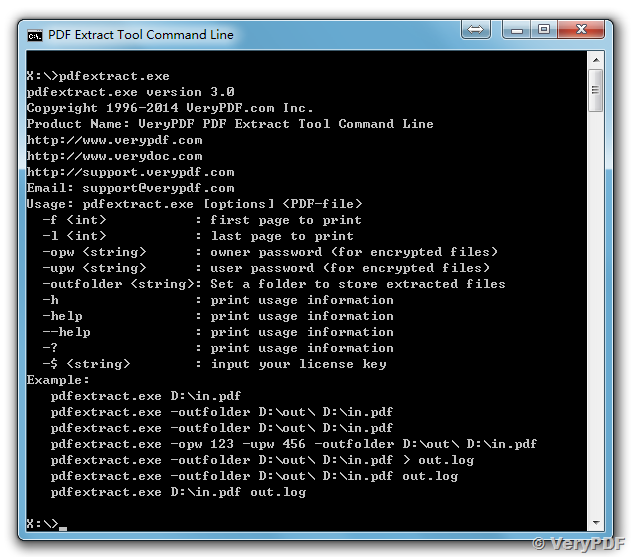 VeryPDF has released PDF Extract Tool Command Line software today, this powerful command line application will allow you to extract anything from PDF file easily, if you want extract something which not included in current version of PDF Extract Tool Command Line software, please feel free to let us know, we are glad to add this function to you asap. 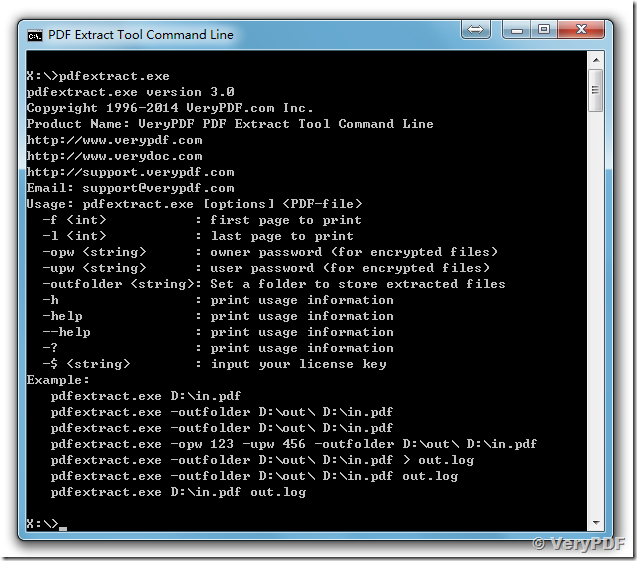 PDF Extract Tool Command Line is a command line application, you can call it from your source code easily by CreateProcess() or exec() or system() or other similar functions. [Extract Text File] Save to "X:\test\_test-embedded-fonts2\original-ABCDEE+Arial Black-61.ttf" file. [Extract Text File] Save to "X:\test\_test-embedded-fonts2\original-ABCDEE+Arial Rounded MT Bold-63.ttf" file. [Warning] Can't find 'Arial' font. [Extract Text File] Save to "X:\test\_test-embedded-fonts2\original-ABCDEE+Calibri-66.ttf" file. [Extract Text File] Save to "X:\test\_test-embedded-fonts2\original-ABCDEE+BankGothic Md BT-68.ttf" file. [Extract Text File] Save to "X:\test\_test-embedded-fonts2\original-ABCDEE+Candara-70.ttf" file. [Extract Text File] Save to "X:\test\_test-embedded-fonts2\TextFile.txt" file. [Extract Text File] Save to "X:\test\_test-embedded-fonts2\TextFileWithPosition.txt" file. 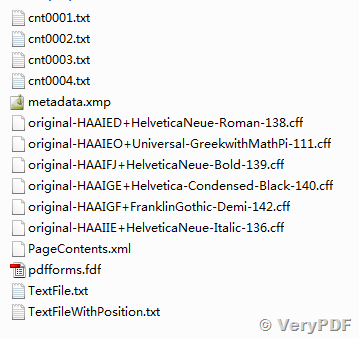 Dump Document Summaries from PDF file: "test-embedded-fonts2.pdf"
Dump Form Name, Form Type and Form Values from PDF file: "test-embedded-fonts2.pdf"
Dump Annotations from PDF file: "test-embedded-fonts2.pdf"
[INFO] 'test-embedded-fonts2.pdf' file is 'NOT Encrypted'. cnt*.txt are extracted text contents. metadata.xmp is extracted metadata data. *.cff; *.ttf; *.afm are extracted font files. PageContents.xml is contain the extracted drawings, this XML file is contain text, drawing, colorspace, font name, matrix, graphics state, etc. issues. pdfforms.fdf is contain form information of input PDF file. TextFile.txt is contain text information. 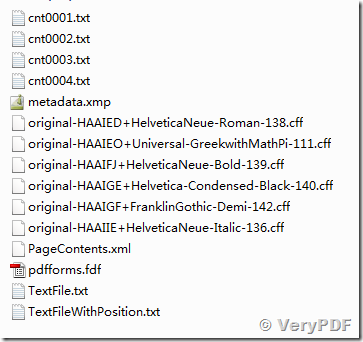 TextFileWithPosition.txt file is contain text contents with positions. You can parse these information for further processing. If you need some useful information which not extracted by current version of PDF Extract Tool Command Line software, please feel free to let us know, we are glad to assist you asap. How to add lines when stitch PDF pages? This entry was posted in @VeryPDF News and tagged extract content, extract data, extract font, extract image, extract PDF font, pdf exporter, pdf extract tool. Bookmark the permalink.